The talented Polly Guo (pollums.com) has released a special digital edition of her two Houdini & Holmes graphic novels. This new version has extensive edits and revisions to the script and artwork, plus 22 pages of extra content, including concept art, historical notes, and a fun extra story called Quite a Pair. Polly's story finds Houdini, Conan Doyle, Holmes and Watson embroiled in the murder of a spiritualist (Houdini, of course, is a chief suspect). One bit of fun is Polly illustrates the real-life moment when Houdini did his thumb racket for Doyle, amazing the author with his "powers". Bess is also part of the action as her husband's wily helpmate in various sticky situations. Again Polly shows she did her research with Houdini at times calling Bess "sweetie wife mine". 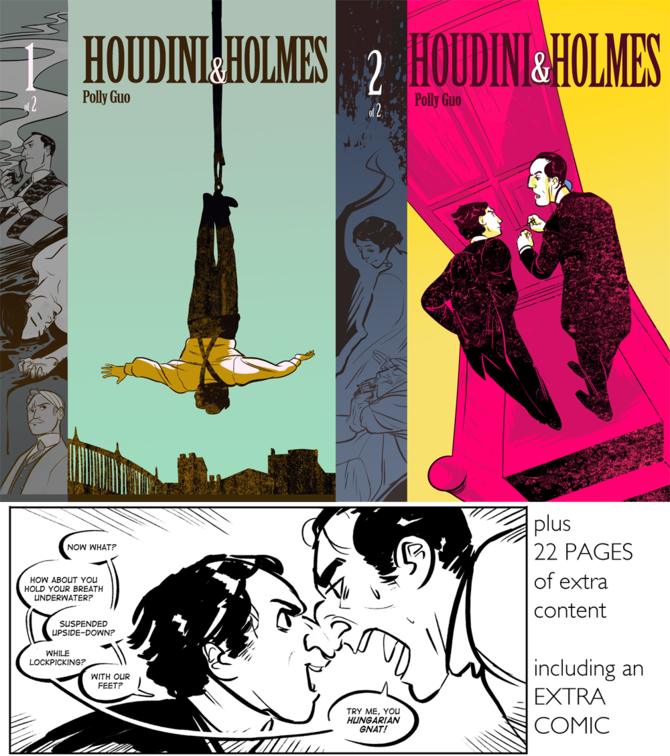 Buy the Houdini & Holmes Special Digital Edition HERE. You can also buy digital editions of Issue #1 and Issue #2 separately.